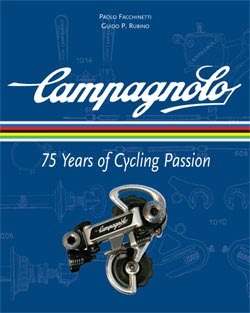 This fall, revered cycling component manufacturer Campagnolo celebrates 75 years of its glorious and storied legacy with a new book: Campagnolo: 75 Years of Cycling Passion. The book includes a chapter on the company's legendary Super Record group and on the new 11-speed Super Record group, which Campagnolo launched at Interbike in September. The book is now available in bookstores, bike shops, and online in the U.S. and in Canada and will be available soon in the U.K.
As Leica is to cameras and Ferrari to racing automobiles, Campagnolo is to cycling: designer of the finest parts for bicycles ever made. Campagnolo's jewel-like brakes, pedals, derailleurs, cranksets, and wheels have been ridden to more race victories than any other brand, yet the same components are available to cycling enthusiasts worldwide. Campagnolo's rich history began with the founder, Tullio Campagnolo, a racer who turned to creating better bicycle parts when he found the equipment of the day inadequate for the rigors of professional competition. Blending exotic alloys with sound engineering, Campagnolo created a series of patented designs that are still in use today as the fundamental standards upon which modern parts are based. With its deeply researched history (much of it from the company's private archives), spectacular color photography, rich text, and lavish presentation, Campagnolo is a book for every lover of the sport of cycling, as well as connoisseurs of the bicycle itself. Color and black-and-white photos and illustrations throughout. See velopress.com for interior pages and photos.